The location was in downtown Washington DC, one of those intersections made magic as I have other photographs taken from there. The "Take It" came from a downward glance as I was getting back into my car. 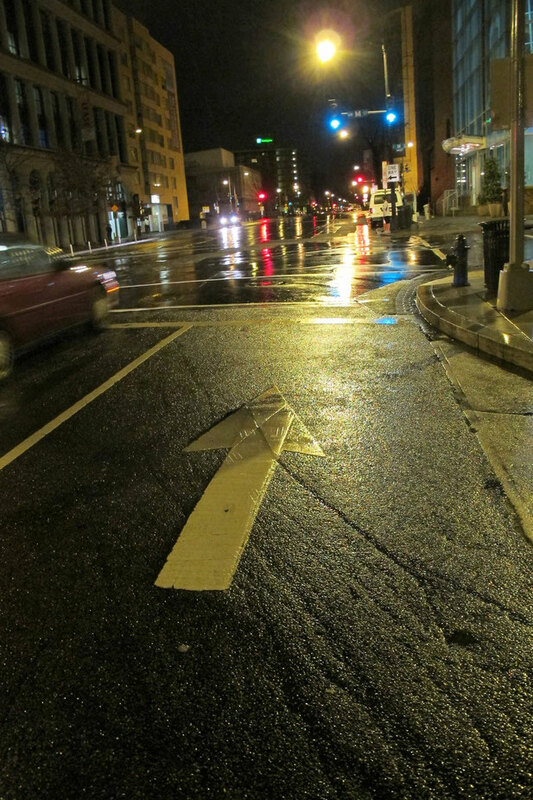 Somehow the rain wet street made the directional arrow pop, which caught my eye. The pause and follow through look made the rest of it easy. The near river of street light reflection is wonderfully bright and draws one right up the street. The street lights are the back up to the arrow which is the big star. The town car that is having a bit of a blur attached to it on the left of the photo helps to bring some action dynamic to this early morning scene in which I was one of three visible players to my eye (myself being one of them). Funny how almost passive the green overhead signal lights are. The After Take: People when shown this photo all seem to like it for the sake of a sort of art form. I tell them the label I had given it and the reasons being that the arrow is giving a clear and strong directional message as to the way to be taken. The traffic lights are giving official sanction to go ahead and do it. The street lights helping to have it safely happen, all seem to be a conspiring for safe passage. I also, with viewing time, see the pattern of water run off that has formed in the asphalt in the lower right portion of the picture. The irregularities in the edges of the river of reflective shine from the street lights as it flows toward us, all of this brings textures that add to the fun of the shot. Thank you for joining me in this retrospective and truly reflective photo take. You in the blue light district? Lol. Those green lights have a very blue hue to them... Once again they put "too much blue goo in the stew...."
Interesting shot nonetheless. The wetness of the photo really brings out the different color lights! The blue light district, hahahaha. One block before the red light district which can be seen just ahead. 6:45 am, dark, and wet. That is not my ideal location at that time of day. The way you took the picture almost makes it look like the guy driving by is in an extreme hurry; late to work maybe? That is too funny Rick.